As usual, the semester got busy and the poor blog got neglected. I’m working on a longer post on my Arduino coin sorter using eddy currents, but I wanted to share a few things right now. In early 2008, I bought a first generation Apple Time Capsule for use as a wireless router and backup system. Minus a few corrupted sparsebundles, the Time Capsule has served us well. However, I kept running across post after post on technology blogs about Time Capsules dying, so I have been increasingly careful to have other backups. Over the weekend, my Time Capsule went kaput. Upon being plugged in, the light came on for a second, it flickered, and then shut down. Being 4 years old, it was way out of warranty and so after buying another (I know that there are other solutions, but I like this one) I decided to rip apart the old one. I’ve never had an Apple product out of warranty that I could just dissect and so this was a new experience. I consulted a few blogs, used a hair dryer to peel off the rubber bottom, and went to work. Once I unwrapped the power supply, the problem was pretty quickly evident. 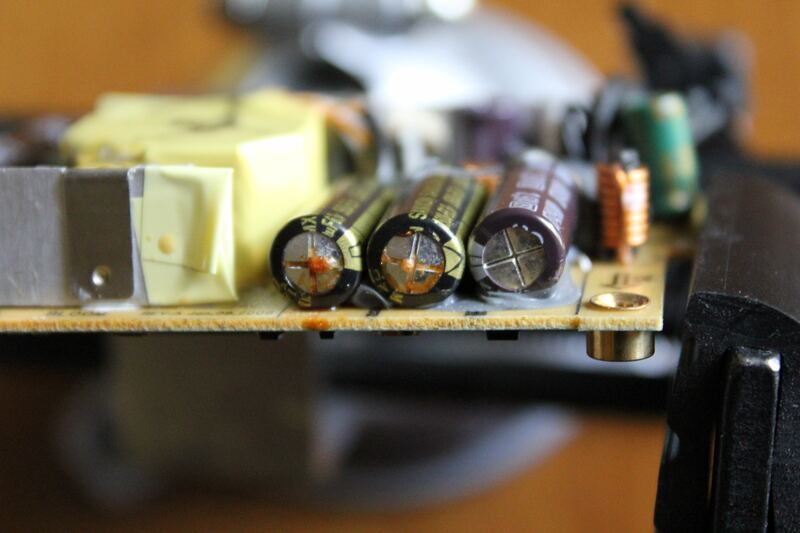 At least two of the electrolytic capacitors were bulging and leaking orange goo. I’m planning to try and replace them just for the experience. My philosophy is that it’s already dead, so I can’t break anything that isn’t already broken. As a quick shout-out, Jeff Keyzer (@mightyohm) tweeted about a great ECE student’s blog called Needs More Lasers. I really enjoyed the posts so far so check it out! The project is continuing to move along. As you can see from the post above, today I got this beautiful Adafruit LCD Arduino shield up and running. Isn’t it so pretty? I have to admit that this whole project has been quite a bit more challenging than I thought it would be. However, I think it’ll still be a smashing success in the end. 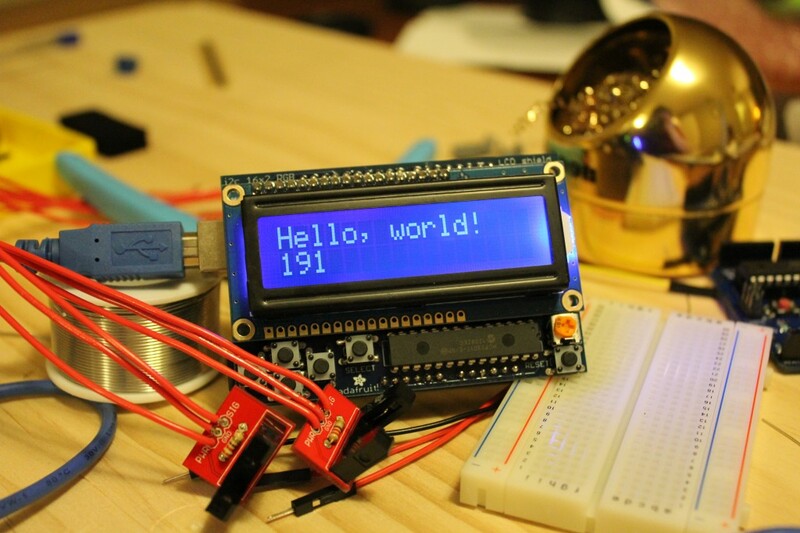 You can also see the Sparkfun photo-interrupters and the breakout boards below the display. I also got the code for those kinda working and so if I start putting the two things together, we might actually be getting somewhere. My dining room table has turned into an electronics wasteland, it might be time to start seriously considering a workbench. My husband has been really understanding of my mess but it’s starting to drive even me crazy! Homework calls again, but I’ll try and put all the pieces of the project together this weekend. Wahoo! The beginning of a new project! I started planning for a new project this week. We started studying eddy currents in physics this week, and I read online that the principle was used to determine the identity of coins. I found a really interesting YouTube video here, and I was fascinated with the idea. I have two Arduinos sitting around so I decided to use it as the microprocessor because, well, that’s what I have. I’m ordering two IR photogates to determine the time it takes for a coin to roll down a ramp with a strong magnetic field in the middle that will slow it down according to the material makeup. I’m also ordering a 16×2 LCD output to display how long it took to travel between the two photogates and the coin identification. I’m excited about the programming challenges of this project. I have to figure out exactly when the photogates are tripped, come up with an accurate delta t, and then compare that to a range of known values to identify the coins. I can’t wait to get my supplies so I can get started on this new project. I hope I’ll have fun pictures and updates on this project soon!! Well, it’s been a while since I’ve posted. The reasons for this are quite varied. First, my site was hacked. What an eye-opening experience. Previously, the security on my site was fairly minimal because I thought that no one would bother trying to break into a little personal blog. Apparently that’s not true. Some foreign entity inserted some malicious code in practically every page that resulted in a redirect to a spam page. I ended up wiping the entire site and starting over in order to make sure none of the bad code lingered. I also beefed up my security measures and learned some valuable lessons in how to systematically back up a website. It was a bit of a pain, but I think that the lessons I learned were so valuable that I’m almost glad it happened. Second, school got crazy! A 15 hour course load of only core engineering classes with three (3!) labs is pretty rough. I’m staying on top of it, but it takes some serious time and commitment. However, I feel like I’m learning SO much this semester. I’m deep into assembly language in digital systems, and I’m loving it. 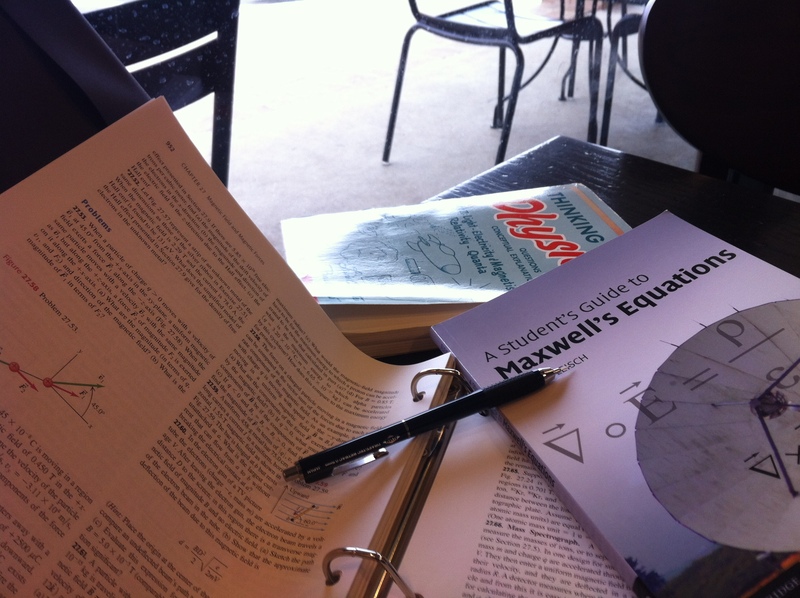 I’ve been spending time outside of class on getting a really solid grasp of Maxwell’s equations (I even ordered and read this fabulous book). I’ve also been participating in MITx 6.002x, which seems like a lot on top of my courses but it’s been so valuable. It is very similar to my classes I’m taking right now, but it takes a completely different approach. I remember when reading through Richard Feynman’s memoirs, he always emphasized that one of his most valuable tools was a different approach. When Feynman taught himself geometry and calculus, he made up his own symbols and used bizarre methods. Although this drove his teachers crazy, he went on to say that this helped him solve very difficult problems later in his career because he didn’t follow the conventional tactic. In this MITx course, they start from fundamental theory and show many different methods to solve complex circuits. I think this will be a huge advantage as I move along in my curriculum. Finally, I have a bit of exciting news. I’ve gotten some nibbles regarding my summer internship applications! I couldn’t be more excited. I’ll have to wait a little longer to see how things pan out, but this is a huge affirmation that my hard work and dedication is paying off. I’m currently on spring break, and I spent the first half relaxing and running the millions of errands I put off during school, so back to the books. I have four days to get some really solid studying and advance preparation done. I know it’s so geeky, but I love when I have the time to make beautiful outlines at a leisurely pace and get a few weeks ahead in reading. Hopefully, I’ll have a little more time from now on to do some more blogging about interesting projects! Yesterday I was presented with a real life ethics problem. A classmate asked if he could see my data from a lab so that he could copy it. We had to build a blinking light and then do a few measurements on it and his light never worked so he couldn’t get the measurements. The lab manual in this class specifically forbade the copying or false manufacture of data, and so I said no. But the truth of the matter is that it is a big deal. My TA is a bright fellow and I’m pretty sure he would notice if 4 people (two sets of partners) had the same data. Academic dishonesty convictions can follow you for a very long time and have serious ramifications on your future. Even putting that aside, my ethical “red light” was flashing like crazy and I knew I couldn’t do it. Now don’t get me wrong, I’m always open to helping out my fellow students. I’ll help explain (to the best of my ability) confusing topics, I’m happy to work though homework problems with other students if it is allowed, I’m willing to share notes if you miss a day. On the other hand, I will not give you straight answers on homework and I’m not going to give you my code unless the professor allows it. I’m willing to push boundaries of conventional thinking, I’m willing to break stereotypes, but I don’t budge on academic rules. If an engineering research lab fabricates data, someone is going to find out and the reputation of that lab will be on the line. If a company copies code from someone else, they could be subject to lawsuits and destruction of their product. No one benefits from trying messing around with plagiarism. People like to make lawyer jokes about how sleazy and unscrupulous attorneys are, but as a whole I’ve seen the complete opposite. Attorneys know that crossing professional responsibility lines can result in loss of your law license, malpractice lawsuits and huge fines. In general, they know where the lines are and try earnestly to stay inside of them. I think law school really taught me to be very careful of those pitfalls. Well this turned into a bit of a long sermon, but the topic is really important to me. Ethics are not a joking matter. The course introduces engineering in the context of the lumped circuit abstraction. Topics covered include: resistive elements and networks; independent and dependent sources; switches and MOS transistors; digital abstraction; amplifiers; energy storage elements; dynamics of first- and second-order networks; design in the time and frequency domains; and analog and digital circuits and applications. Design and lab exercises are also significant components of the course. You should expect to spend approximately 10 hours per week on the course. I think I’m going to sign up because I’m intrigued by the idea of open education. Also, I think it might give me a leg up in some of my future EE courses. I’m hoping that having a semi-solid background in the material means that I won’t have to spend 10 hours/week but we’ll see. I don’t know if there are any ramifications for dropping a free, online, prototype course. Anyone else giving this a try? This semester is busy, busy, busy! I have fallen head over heels in love with my digital systems class. So far we’ve done the “easy stuff, ” but it’s still so interesting. We started with binary, went to 2’s complement, learned basic Boolean algebra, eased into various gates and circuit design and just finished simplification and Karnaugh maps. When I’m doing my homework for this class, it doesn’t feel like work, it feels like a brain teaser. I LOVE brain teasers. I think that brain teasers are such a valuable learning tool. I did tons of brain teasers growing up, and I think it was one of the best ways to learn how to think outside of traditional linear thinking. When the linear path fails, approach the problem from the other direction. One lesson that has ingrained in my brain is the technique of bounds checking. What are the constraints of the given problem? If it doesn’t have to be on Earth, try another planet. See what happens when gravity is gone. Do we have to be in modern times? What if we were in imperial China? In the lab for the digital systems class, we built circuits on an educational prototype board using actual AND, OR, NAND, etc. chips. It’s one thing to learn the concepts when they’re these amorphous ideas that are pretty tough to picture. It’s another thing to actually build a circuit, send voltages through the various inputs and see the outputs predicted by truth tables and equations. This is another one of those things that must seem like ancient technology to practicing engineers, but seeing it in person for the first time is a little bit magical. My other classes are going well. Physics is a bit of a struggle right now. The professor is incredibly passionate and does great demonstrations in class which really reinforces the big concepts. As a student, I’m left to learn how to implement the equations and concepts on my own. I think I’m doing pretty well so far, but his tests are take-home and so I know they’re going to be tough. Tomorrow, I’m going to finish my last kit, and then I’m on to some new things with the Arduino. I can’t wait! I completed my second Arduino project with the help of the wonderful tutorial series by Jeremy Blum. It was so much fun! I ordered a few things from SparkFun and now I feel like I have a pretty good setup for future projects. In this tutorial, we set up a little circuit with a push button. I learned all about debouncing a switch (I liked the explanation given here), a concept that was totally new to me. I got to apply some programming knowledge to play around with inputs, outputs, LED brightness and such. A good time was had by all! Actually, I was the only one home and the dog didn’t seem particularly impressed. He gave me a quizzical look and then went back to sleep. School is humming along quite nicely. Again, this semester is not going to be a cake-walk but I love what I’m learning. My professors are a hoot. Truly, they keep me on my toes. Every class expects preparation and participation. Speaking of preparation, I’ve probably played around with the Arduino enough for today. Time to get back to the books! Sully (the chocolate lab) insists. This picture is him seven years ago. This obviously has nothing to do with engineering. It’s just cute. The first week of school is finished. I’ve been to all of my classes except one monday-only class and my physics lab. So far I really love all my classes. I have a particularly passionate group of professors. Every single one of them has emphasized lifetime learning, good study habits, the importance of outside learning and such. One professor went on a tangent about Grace Hopper, one of my personal heroes. Another professor gave us a homework question that Richard Feynman answered in Six Easy Pieces, and I’ve read everything by Feynman about ten times. It’s great to see that my outside reading is so relevant to my classes this semester. I took a little bit of my downtime this weekend to play around with my last little kit. My soldering skills are still pretty terrible but they can only go up from here. I do have a question for any of the female engineers who might read this blog. What do you do to keep your hair out of your workstation? I used bobby pins on my fly-a-ways on my ponytail and STILL managed to singe a stray hair. I have done this every single time I’ve tried to solder so far. I’m going to set myself on fire at this rate. I decided to put the workstation on the back burner for now. I’m using a scrap piece of wood as my work surface and taking over the dining room table temporarily. I bought a plastic toolbox to store my growing set of tools and stuff and so I can just tuck away my electronics stuff when I’m not using it. Packing up the stuff semi-regularly isn’t ideal but an entire workbench doesn’t seem like a perfect solution for the moment either. The dining room table was always my study place so my husband doesn’t miss it that much anyway. The picture above is my temporary workstation. Time to go learn two’s complement & flip-flops.